Paramount Records was produced by New York Recording Laboratories (NYRL) who were owned by the Wisconsin Chair Company, which was headquartered in Port Washington, Wisconsin. The last Paramount label records were sold were in Aug 1932. The Black Swan Record Label was bought by Paramount in May 1924, discontinue it, and then re-introduce it as the Paramount Black Swan Label in June 1924. A redesign of the Black Swan Label would be introduced. The following year, in 1925, Paramount Records would acquire the Broadway Record Label from Bridgeport Die and Machine Company of Bridgeport Connecticut. America Record Company (ARC) would buy the Paramount label in 1934 and release a few records before discontinuing the label. ARC would also drop the Broadway Label in 1934. Decca would pick the Broadway label up for a brief time in 1935 only to discontinue it within the year. Paramount was revived in 1948 by the Wisconsin Chair Company and by 1952 was producing reissues of older recordings. By 1970, the recordings of Paramount were sold to the Jazzology Records group but the name “Paramount Records” was sold to Paramount Pictures. During the first 7 years until Aug 1926, all Paramount label records were blue and gold. The Paramount logo was an eagle with spread wings. In 1926 the color changed to black with the phrase “Electrically Recorded” in lowercase type near the right of the spindle hole. Labels printed before 1925 state the following phrases “This Record is Made Entirely in Our Own Laboratories in New York City and Grafton Wisconsin” or “This is a Vertical Cut Record Made in our own Laboratories” around the rim of the record.After 1925 the phrase along the record-bottom rim changes to “The New York Recording Laboratories Inc.”. Music Genres: Race Records, Country, Blues. Pre-1941 Label: 1918-Aug 1926. Consists of blue and gold coloring. Sometime after Aug. of 1926 the label had a redesign to black and gold. Paramount Record Label: 1926-1932. The spindle-hole phrase “Electrically Record” came about in 1926. The phrase along the bottom, “The New York Recording Laboratories Inc.”, came about in 1925. Note the black and gold coloring. Black Swan: Black Swan, an almost exclusively “race record” label. This label may be seen in orange and black, yellow, red, blue, black, purple, or red. Paramount would buy the Black Swan Label in May 1924, discontinue it, and then re-introduce it as the Paramount Black Swan Label (keeping the black swan logo but adding the Paramount wings) in June 1924. Black Swan Record Label: Note black swan icon at top. Record Label: Black Swan label as bought by Paramount in 1924. 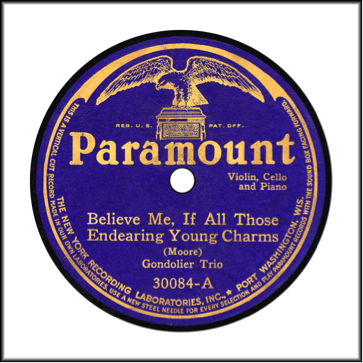 Broadway Record Label: This record label was in production by Paramount from 1925 to 1933. ARC would drop the label. Decca would pick the Broadway label up for a brief time in 1935 only to discontinue it within the year. Note the black and gold coloring. Post World War II Label: 1948 redesign. Silver and black coloring. Notes: The 12000- series is the labels “Race Record” series.